The number of people who follow the famous Atkin's low-carbohydrate diet has gone off the scale in recent times. But until now there has not been a single book for vegetarians who want to try a low-carb lifestyle. Not only that, but for the millions of people who want to reduce their carbohydrate intake, but who don't want to eat meat ALL the time, there has seemed to be no other option. 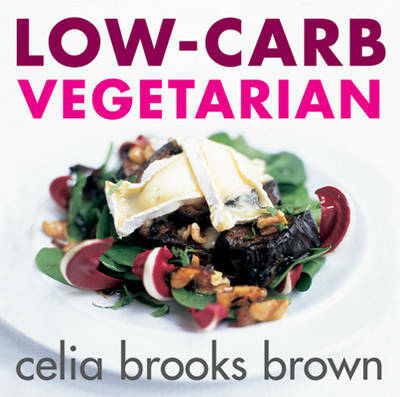 Celia Brooks Brown's 'Low-carb Vegetarian' offers a complete range of easy, satisfying and stylish low-carb recipes designed specifically for vegetarians. With all recipes approved by the well-known nutritionist Fiona Hunter, the book offers a varied and exciting menu, that doesn't limit choice in any way. All the recipes are easy to cook, and are high in protein, but relatively low in fat and, of course, low in carbohydrates. Nutritional information is given with each recipe, and ingredients with special health-giving properties are highlighted (eg. Chilli Crust Brazil nuts are high in selenium). A complete diet is included, from fortifying breakfasts and satisfying main courses, to light lunches and snacks. There are even chapters on party food and sweet desserts. 'Low-carb Vegetarian' is the ideal companion for those who are trying to lose weight and also those who simply want to follow a long-term weight-maintenance lifestyle.